I recently migrated over to a different laptop (a Toshiba C655), and was faced with the prospect of moving several hundred bookmarks and passwords over from my ancient Dell—a task I was not looking forward to, as I am really pressed for time right now, but can’t be without that information. Fortunately, I found a handy small program that will both backup and migrate your profile for any Mozilla product: MozBackup. Unfortunately, this is a Windoze-only application. There is no Mac or Linux version available. In installed it on both computers. I let the operation finish, restarted Firefox, and all my bookmarks, all my stored passwords, all my site preferences were already there. There were a few other steps involved, but if it seems that simple, it really is. 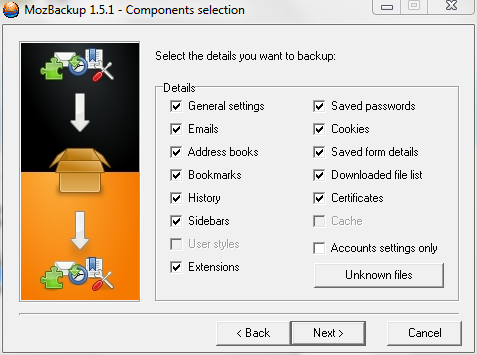 The program also gives you the option of saving your profile with a password. 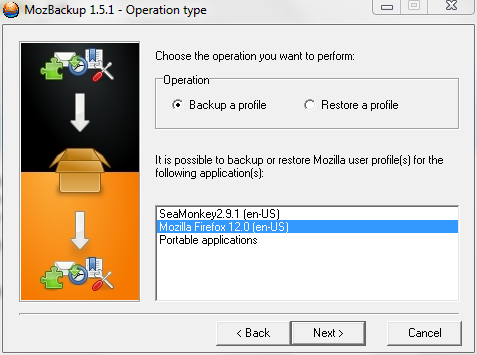 MozBackup made this a painless, simple process. I highly recommend it. I certainly will be backing up my profiles on a regular basis now.